Londonderry NH - Participants in Stonyfield Farm's 5K walk/run and free Earth Day Fair on Saturday, April 20, 2013, in Londonderry will be helping bring a native rabbit back to New Hampshire's landscape. Each year, Stonyfield donates a portion of the proceeds from the event to an organization - this year, donations will go to the New Hampshire Fish and Game Department's Nongame and Endangered Wildlife Program for work restoring the New England cottontail. For more information on the race and Earth Day fair, visit http://stonyfield5k.com. Stonyfield Farm provides habitat for one of the last remaining populations of New England cottontail in New Hampshire. "The population of New England cottontails occupying the landscape around the Stonyfield site is possibly the largest in the state," said Heidi Holman, a wildlife biologist with Fish and Game's Nongame Program and the leader of the cottontail restoration project. "Their collaboration in creating habitat has boosted the population of this endangered rabbit in the area." Initially, just two of the 11 acres at the Stonyfield site were suitable for the rabbits, which need thick shrubby growth for food and protection from predators. Only 1 or 2 native rabbits were documented in the area before work began to make space for young forest to grow. Four years later, suitable habitat conditions have developed. 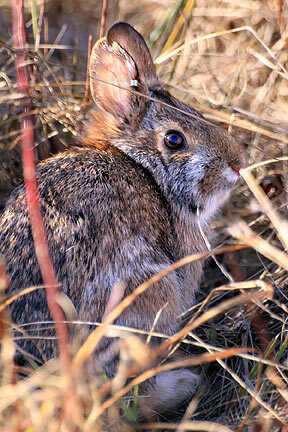 Today, some 5-10 New England cottontails can be found throughout the entire 11 acres of habitat. "The U.S. Fish and Wildlife Service is excited to participate in the 5K and fair and encourages people to learn about the New England cottontail and the race to save the region's only native rabbit," said Anthony Tur, New England cottontail coordinator for the U.S. Fish and Wildlife Service. "We also commend Stonyfield for their efforts in New England cottontail conservation. The restoration project at Stonyfield Yogurt Works has been the most successful project so far, with positive results for habitat and the rabbit population." The Nongame Program and the Service's New England Field Office will host a scavenger hunt during the children's race and a booth with fun New England cottontail activities and important information about the conservation effort. Restoration of New Hampshire's only native cottontail is a major effort among six states to restore their population and protect them before they disappear forever. New England cottontails are endangered in New Hampshire and are a candidate for listing under the Federal Endangered Species Act. They occur in parts of southern Maine and New Hampshire, Massachusetts, Connecticut, Rhode Island and southeastern New York. Their current distribution is less than a fifth of their historic range. To help bring back these rare rabbits, N.H. Fish and Game's Nongame and Endangered Wildlife Program is working with the U.S. Fish and Wildlife Service and other partners to create more of the shrubland habitat that New England cottontails need for food and shelter. In addition to the Stonyfield site in Londonderry, this work is occurring in several areas in southern and central New Hampshire. Biologists have also provided supplemental food for the rabbits during the winter months and are actively monitoring areas where wild New England cottontails are known to still occur. Another exciting part of the project is the Nongame Program's partnership with the Roger Williams Zoo in Rhode Island, where nine New England cottontails were born in a captive-breeding facility last year. Last September, these rabbits were transported to a special outdoor enclosure in Newington, N.H., at the Service's Great Bay National Wildlife Refuge, where they spent the winter while transitioning to life in the wild. Learn more about the New England cottontail at wildnh.com/Wildlife/Wildlife_profiles/new_england_cottontail.html. N.H. Fish and Game Department's Nongame and Endangered Wildlife Program, celebrating its 25th anniversary this year, works to protect over 400 species of mammals, birds, reptiles, amphibians, and insects and other invertebrates. Visit wildnh.com/nongame.